Performing 'Digitally' and in 'Shadows"
Finance Minister Abul Maal Abdul Muhith presented the National Budget for 2010-11 fiscal year digitally in the parliament on June 10, using power point for the first time in Bangladesh. His digital performance, a virtual exercise on a virtual reality, streamed through screens and print media in order to fool the common citizens with high and ambitious figures of growth rate. It is a piece of amusement of course. Post-budget responses by various organisations and individuals were also real fun. Say, for example, the summary of the Center for Policy Dialogue concludes that big budget is no problem, the problem is with implementation. It sounds as if we never had such words of wisdom. The funadamental issue for the peoples of Bangladesh is to find a way out of the neo-liberal economic paradigm and define a coherent notion of 'national economy' in this era of globalisation. Within this context budget exercise may be political tool to deliver positive benefits to the people that the liberal market economy can never provide. What we have heard in the budget speech is called ''purana kashundi ghata' an apt bangla proverb, hard to translate. Closest interpretative translation may be pretending to cook a new dish with the wastes of last night's supper, as is done always by the ruling class. Budget exercise is done juggling with unreliable numbers supplied by Bangladesh Bureau of Statistics. Nevertheless, the bottomline has always been how the ruling classes are maintaining the power balance between various sections by deciding how wealth and benefit are shared between powerful competititors through the mediaton of the state. In the budget speech the word 'people' is repeated ad nauseaum, but people are neither the part nor the object of the budget. The performance of the Finance Minister is routine and does not indicate any element of change in macro- economic paradigm. Surprisingly, on the opposition side, instead of being present in the Parliament, we saw for the first time that the leader of the opposition and the Ex-Prime Minister Begum Khaleda Zia presented a 'shadow budget' on 8 June, just two days before the national budget. Smartly, the Finance Minister claimed that his budget reflected almost 70% of the 'shadow budget' presented by the opposition. This is really a drama! But more than that this is a superb example of class alliance on the economoic front indeed! If Bangladesh Nationalist Party likes to demonstrate that they are eager to strike a national consensus with the ruling party to continue the neo-liberal economic policy that benefits very few and exploits the rest of the majority of the people, they could do so easily by joining the budget session. If the BNP's 70% proposition is no different than Awami League, who needs the opposition? What's the value of BNP as an independent political party? The idea of enagging in the budget debate outside the parliment is good, but the purpose in this case is politically deceptive. If BNP intends to build up its political profile by signalling shift from the past, including its history of corruption, a pro-people critique of neo-liberal economic policy imposed by World Bank, IMF, ADB, WTO as well as bilateral bindings is the order of the day. Given the global economic crisis and failure of neo-liberal economic policy, there are ample scopes for a pro-people market economy that may build up a feasible base for economic prosperity. We of course, do not expect or suggesting any radical programme, but only hinting that BNP may seize the opportunity to make a change that could enhance BNP's political profile, while the country may take a step forward. To acomplish that task BNP needs lots of homework and an open heart to acccept its mistakes. However, the disaster was done elsewhere. The 'shadow budget' should have been presented by the committee who drafted the text, not by the ex-Prime Minister. It could easily be organised as a seminar or workshop. It seems her advisers are not aware that protocols are not merely rituals, but creates political meaning. Looking simply, as the common people read and interpreted, Begum Zia is not the counterpart of Awami League's Finance Minister. It indeed appeared disgraceful for a party reducing her role to the role of a Finance Minister. She is expected to participate and criticise the government in the Budget session of the parliament as the leader of the opposition. That is her political role now. Playing the role of public opponents proposing a 'shadow budget' outside the parliament is simply ridiculous. If we stretch the meaning of this event a bit more, one can smell a 'shadow national government' formed by blue eyed boys of both the parties. This is an idea development partners of Bangladesh loves now. It was tried before. If 'Minus Two' is not successful then go for a national government where 'two Begums' could be reduced into powerless figure heads, while the 'boys close to the diplomatic community' can run the show. The exercise of the 'shadow budget' and presenting the text by Khaleda Zia implies that there might be such design in operation. Proposing a 'shadow budget' 70% of which Awami League can incorporate means what we got is a BNP budget. What matters to the develpment partners is the economic sector. If such collaboration succeeds, they have alrady suceeded 70% in forming a national government. The so-called national government as a new tool of 'governance' is always in the heart of the development partners to resolve perennial conflict and violence, which they assume is caused mainly by two 'battling Begums', and not the policy which International Financial Institutions and bilateral donors impose. Khaleda Zia should consider her future move in this light. The whole exercise appeared as if Begum Khaleda Zia has been used by some of her disgraced Ministers and advisers who are close to powerful sections of the diplomatic community; some are known as collaborators of the operation 'Minus Khaleda'. She must be very cautious to bring to lime light those person or persons who are already infamous to human rights defenders for drafting bills such as tapping the telephone of the citizens amending Telecommunication Regulatory Commission, pioneering money laundering bill and in line with war against terror drafting of Anti Terrorism Act 2006 mirroring Terrorist Prevention Act of the UK and similar laws of the United States, India, Pakistan and Indonesia with the provision of capital punishment, i.e. death. Bangladesh may require a robust economic, social, cultural and political strategy and policy to deal with socio-economic inequality, violence, terroristic means to achieve partisan political goals but must not allow itself to be trapped into the design of 'war against terror' led by USA, India and Israeli axis in this region. Any legal instrument induced by foreign powers to silence the opposition voices and to demolish democratic and constitutional rights of the people will create conditions for the abuse of the judiciary and torture that we could see clearly now in the case of Mahmudur Rahman. The farce of the story is that Shaikh Hasina's regime is now framing case against Mahmudur Rahman by the draconian Anti-Terrorist law initiated during BNP's regime. These are serious matters not merely for human rights, but for the future politics of Bangladesh in the regional and global context. Let us repeat. Protocol is not merely formal ritual, but generator of powerful political meanings, good or bad. As a leader of the opposition Begum Khaleda Zia either should have been present in the parliament on the budget session, or simply should have protested on the street for the gross violation of human rights of the regime, particularly after the arrest and torture of Mahmudur Rahman and closure of Amar Desh. A meaningful engagement with the government in power with regard to budget and macro-economic policy should have been left to advisers, ministers or supporters making clear that the political, economic and social philosophy of BNP does not and can not concur with Awami League. 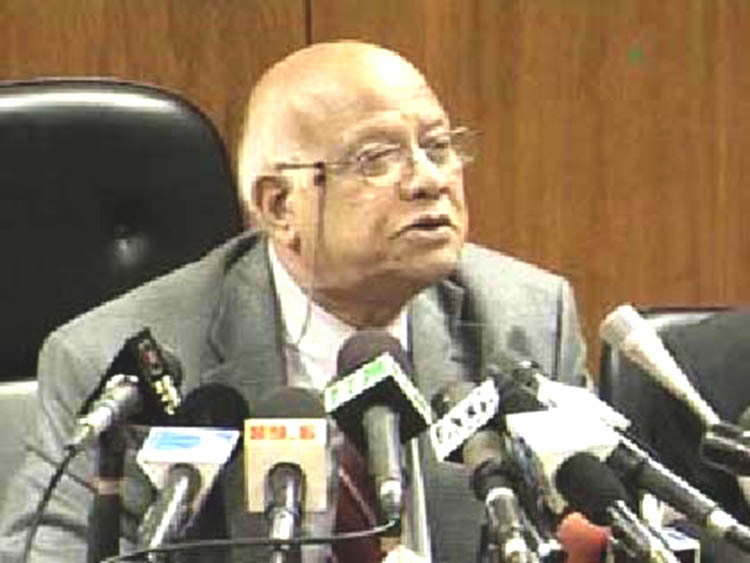 Finance Minister Abul Maal Abdul Muhith's sense of cool humour is a sheer insult, which BNP invited. The event of the so called 'shadow budget' that people saw after less than a week when BNP's ex-energy adviser Mahmudur Rahman was arrested by the present regime and closed the daily Amar Desh did not fare well in the eyes of the mass people. People are behind Mahmudur Rahman and will not be behind BNP if they fail to take proper actions in right time. BNP as a political party can gain momentum only by mobilising people and protest and taking strong stand on human rights. The way government is dealing with Mahmudur Rahman could in no way be acceptable to any political party who uphold Human Rights and International norms against torture and this is enough reason to boycott the budget session. But organsing a 'shadow budget' meeting undermined the protest. The text of the so called 'shadow budget', after all, does not add any bit of salt what Awami League already prepared. While Mahmudur Rahman is being harassed, grilled and tortured, the message from BNP should be clear and loud to the international community. Such gross violation can not be acceptable and Begum Khaleda Zia should make it clear that she wants international norms of human rights are strictly observed and the local diplomatic community must take full rrsponsibility for this act of the present regime. The difficulty we can clearly see is the past history of BNP. But BNP must be ashamed of its past and learn from the mistakes it had committed, if the party intends to make a come back. It is obvious Mahmudur Rahman became overly dangerous because of his virulent style of attack against corrupt politicians, bureaucrats, transnational corporations including Chevron and the alleged deal between the oil giant and the son of the Prime Minister Sojib Wajed Joy. Rahman has been taken to remand to gag, grill and torture for these 'unholy' acts. Only future will prove if BNP allowed this to happen because of organisational weakness or because of the changed strategy of behaving well with the powerful foreign partners. In that case Mahmud unfortunately may become disposable. The story goes in the town that the diplomatic community allowed such gross violation of human rights to go unchallenged because Mahmudur Rahman had been criticising them, in his language, as 'imperialists' meddling into the internal political affairs of the country, although diplomatic community has expressed their concerns. One may argue that they have done it not with the same enthusiasm as they were seen eager to perform before the press in regard to the victims of minority and civil society members. Yes. Mahmud deserves the punishment since he published a leaked out government report led by Anisuzzaman Khan in Amar Desh on the massacre of Army Officers in BDR mutiny that implicates involvement of Prime Minister and her family members including some of his powerful ministers. He indeed, unknowingly played with fire. The regime is fearful that if he is let loose, he might publish the report that is still lying with the Army investigated by a team, led by Lt. General Mohammed Jahangir Alam Choudhury and failed to see the day light. Mahmud therefore will have to face the bitter music. This is the reason Government filing case after case against Mahmudur Rahman and trying to break him down into pieces. If Mahmud survives this ordeal he will be a factor in the power equation, because of the mass popularity he gained for his courageous role during the events of one eleven and after.